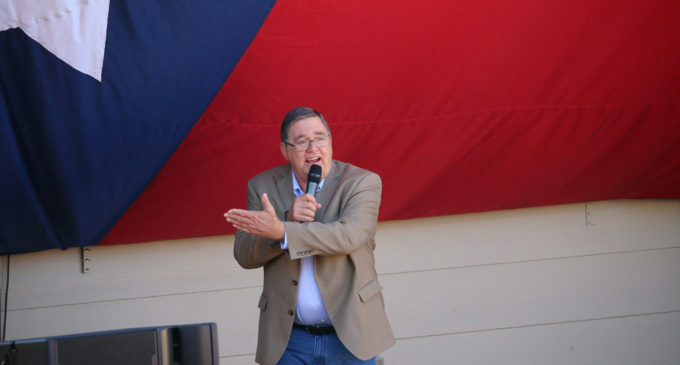 Michael Burgess defeated challenger Linsey Fagan by 63,635 votes Tuesday in the race for Texas Congressional District 26, securing his eighth term. Burgess, a doctor, was first elected in 2002, while this race marked Fagan’s, a SEO specialist, first run for political office. Burgess won the 2002 race with 78.84 percent of the vote. A record 4.8 million registered voters cast a ballot during early voting in Texas this year, up 21.1 percent from 2014. The Libertarian candidate in the race, Mark Boler, received 5,005 votes. Burgess thanked his supporters at a joint election watch party with fellow Republican incumbent Lynn Stucky, who won his re-election bid for Texas House District 64. The watch party was held at The Dive, which opens Nov. 9, with about 400 RSVPs. Attendance dwindled down around 10 p.m.
Burgess handily secured his nomination as the Republican candidate, defeating fellow Republican Veronica Birkenstock 77.44 to 22.56 percent in the primary race. Results released around 7 p.m. showed Burgess in the lead by about 60 percent, which he maintained throughout the night. This midterm election saw a drastic rise in voter turnout in Denton County. According to the Texas Secretary of State’s website, 45.96 percent of registered voters in the county cast a ballot during early voting this year compared to 20.48 percent in 2014. When casting his vote, Haines said he looks at each individual candidates’ platform on small businesses since he is a small business owner. Because of this, Haines said he does not vote straight ticket for Republicans. “Sometimes [what’s best for small businesses] doesn’t fall with either Republican or Democrat,” Haines said. Attendees ate food that was provided as they watched the television screens on every wall of The Dive to keep updated on elections across the country. Attendees cheered each time a Republican was projected to be the winner for their race. Fagan’s watch party was more subdued, however. Burgess’ Democratic challenger held her election night watch party at Texas Bleu Steakhouse in Keller with around 40 attendees. 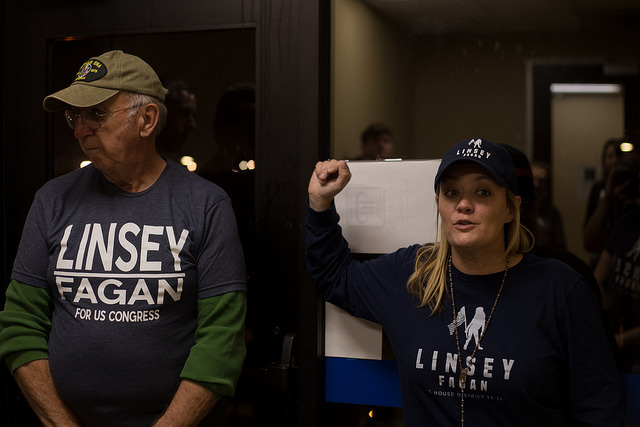 Fagan also thanked her supporters following her watch party and talked about the precincts they were able to turn blue, listing Little Elm, a lot of Frisco and parts of The Colony. Fagan went on to be the Democratic candidate for TX-26 after defeating fellow Democrat Will Fisher in the primary elections in March by 51 to 48 percent. Near the end of the night for the Fagan campaign, communications director Meredith Plunkett spoke through tears but was proud of the things their campaign was able to do. Those inside at the bar booed when CNN projected Republicans would hold onto the house and cheered when Democrat Colin Allred was the projected winner for TX-32, defeating 11-term Republican Pete Sessions.